Slate Roof Central Message Board: A primer on metalwork for permanent roofing. I see how the front apron pan/drip edge which the gutter trough eventually locks into is attached to the structure (with cleats) to the roof deck but is it fastened on fascia or the under side of the soffit or just left free like a typical drip edge? I have searched through your various pics on different sites and have not seen a clear photo of this detail yet. Your right about having to go to Europe, although over there it isnt a secret. It is taught in the trade schools. Like you I am an enthusiast as opposed to a pro and over the years I have been trying to put together a small library for myself concerning this type of metal work. Many of my books, manuals and videos are from Germany, the UK and some early 20th cent US publications. I have also followed some of the modern posts and information put out by people like Kword and others on sites like this. I find that I am able to understand the geometry of some of the techniques better by practising with paper and tin foil models after working out the problems at the drafting table. Thanks for the pictures, I think what you're doing is very impressive. I would love to learn even the basics, but feel like I'd have to go to Europe to do so. I wish someone like yourself could do what Joe has done for slate and write the bible for traditional metal roofing, if such techniques can even be learned by book. From my vantage as an enthusiast, what your doing is a secretive art. Information is scattered, the barrier to entry is steep, professionals are few, projects are distant and grand, with honest discussion regarding the pros/cons, or environmental impact of metal roofing appearing to be non-existent. I watch from a distance, but it's looking good. I have seamed up to 22oz. no problem. The temper should be 1/8 hard. When I use 1/4 hard gutter coil (only way it comes most places) I have to mark the areas with curved seam and anneal before the trough is set in place for seaming. What weight/hardnesses are you using for these non-soldered techniques? Are all the flashings and gutters shown 20 oz half hard or is there a mix of 16 and 20 oz of various hardnesses (1/4, half, etc) depending on the detail? And the video of seams, showing all the work up close. Anyone putting metal on a roof should be willing to show details, all the way up close. We should have nothing to hide. I challenge others to show your details! Soldered work hides either a lap seam or single lock seam. Once soldered together those pieces become a monolith. A seamed roof or detail leaves each individual piece as an independent unit. If damaged it can be removed, and a new pan seamed in without disrupting the entire assembly. 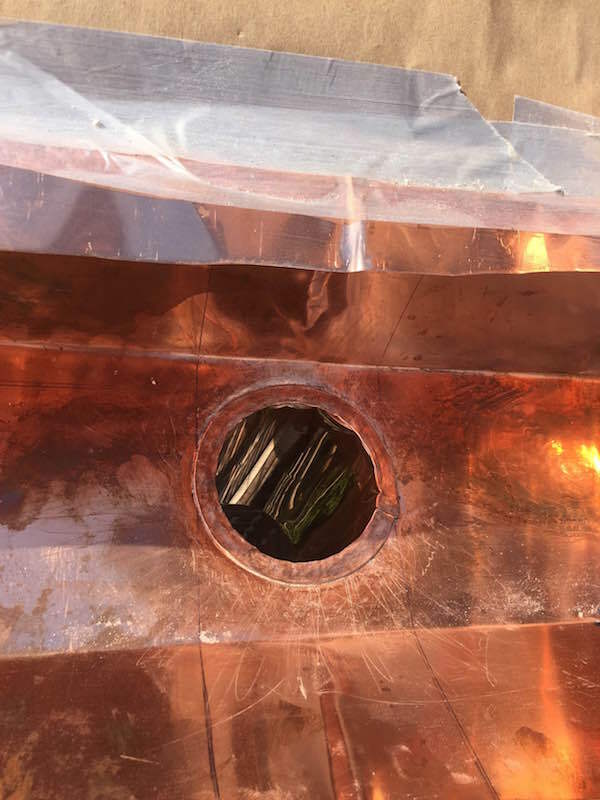 Also inspections are much easier because rather than guessing weather a joint was sweat all the way through: you can see the seam and inspect any defects in the work with a single 180 degree turn of the 2nd lock. It is the most logical, effective, and time-proven way of joining metalwork on a roof. Every edge of every pan is seamed together, with no cuts in the base sheets or walls. There is no need to employ solder on anything, even a built-in gutter. Gutters are essentially a sunken valley, and when treated as such, can be seamed as well, with care and planning. The transverse seams on gutter pans must be formed in the flat to make a continuous sheet. 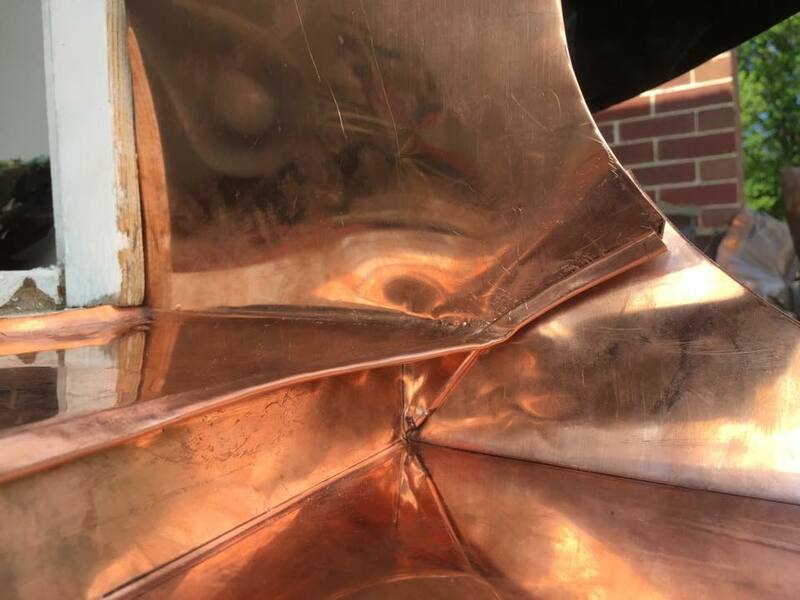 If a seamed metal bucket can hold water, so can a properly seamed gutter. You can't have slate roofs without metalwork! Well, maybe you can in the simplest of straight gable roofs with no protrusions... but we're roofers, and our skills need to be ready to tackle any detail or situation on the roof with an assembly as permanent as the slate itself. I started my career doing cornices and built-ins. But I spent years studying the history and fundamentals of metalworking before I ever installed anything or billed a customer for it. My family had some deep roots in the sheet metal trades, and roof tinning trades. (one: a grandfather, who died before I got a chance to meet him was a foreman and union trainer for pattern drafting and mensuration, in a commercial hvac shop in the 50's) (the other, a great uncle, started as an apprentice to a roof tinner in the 30's and worked his way up to shop owner doing tin roofs all over the region, most are still standing) The former is now retired but he had a hand in improving a lot of the early roll-former machines that make the trade so easy now! They customized and produced aftermarket parts to make window channels, and all manner of roll-formed trim pieces. Now that group has kept up with the times and they are now producing extrusions for the glazing industry. The lineage of these manufactured products that we have today owes itself to the craft that came before it. We are able to have all these great products because tinners and metal men in our past studied hard, and learned the precedents and traditions of their trade in order to be able to develop the tooling and processes needed to form on a production scale. I know my unique circumstances and exposure to generational knowledge and experience is not the norm. However I think it is crucial that anyone that practices fine metalwork should have a background in theory, mensuration, drafting, chemistry needed by metalworkers, and the specifics of architectural knowledge such as proportion and design needed to work on historic metalwork. The tradespeople of the past were primed with the same kind of education. 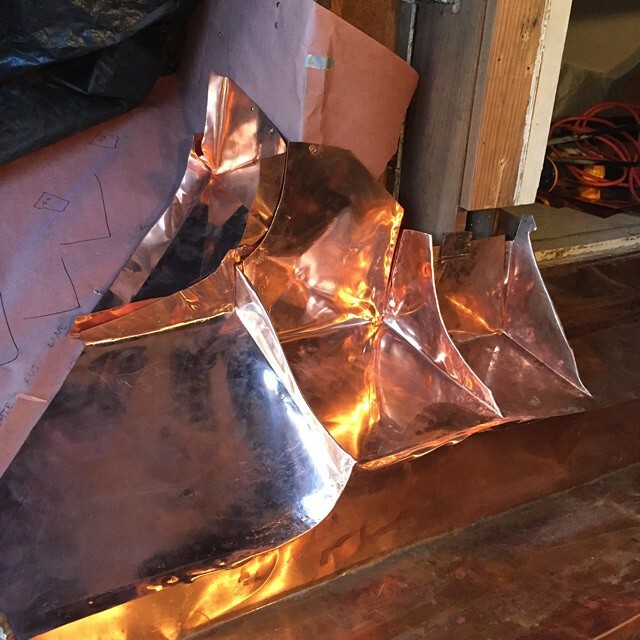 I write this because I see a huge breakdown in the skill level and execution of metalwork that goes into slate projects, either featured on here, in other forums, and even on marketing materials by companies who claim to specialize in "copper roofing" or copper work. We do not have proper standards in any English-based publications that cover the details of how to seam a traditional standing seam roof together, or how to perform any of the seaming and pattern work that is vital to create the most basic details in metal on a slate roof. I am looking to change this. If architects and homeowners can recognize what is right and wrong, metal men will not be able to hide under solder, goop, soup, laps, or caps. The conversation has to change from the top-down. After all, these seaming standards are practiced everywhere else in the world where they actually have oversight on the historic jobs. The work is done to the letter, respecting the traditions and process that dates back hundreds of years. This method of work is not special, custom, or anything out of the ordinary. It is taught in schools, and new students are graduated all the time. If it is standard production work over there, and they are making money and doing it just as efficiently as we slop down soldered and capped panels here: there is no argument as to why it can't be done here too, and why we can't push for it to be the standard. If you are tasked with installing traditional standing seam: or any metalwork detail I challenge you to do better, look into the past for inspiration, look to the future to think: how will this be repaired without scrapping the whole assembly, just like we do with slate..